Visualizing the perfect outfit? These oversized shades by CHiMi Eyewear won't let you down. 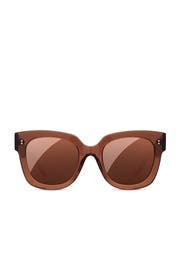 Brown acetate cat eye sunglasses with tonal mirror lenses. 100% UV protection. 54mm / 22mm / 152mm.